Lionel sold these cars only in sets, never individually. #49617 Blue Comet Pullman Passenger Set made in 2007. Baggage Car, two Coaches, and Observation Car. The set is pulled by a Pacific Engine. The Blue Comet Barnard Baggage Car. The Blue Comet Faye Coach. The Blue Comet Westphal Coach. 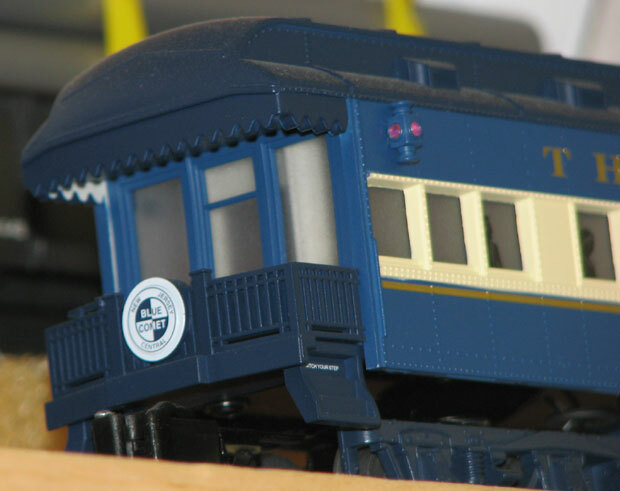 The Blue Comet Tempel Observation Car. Detail of the back platform on the Blue Comet Tempel Observation Car. #48994 Two-Pack made in 2007 as an add-on to the set. The Blue Comet Halley Combination Car from the #48994 Two-Pack.